The TIDA-00419 TI Design is a demonstration of a SONAR receive path sub-system using the integrated analog front end (AFE) AFE5809. 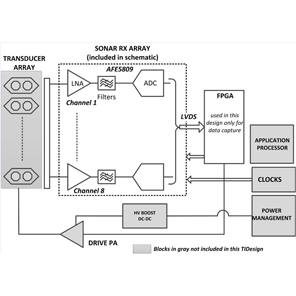 The AFE5809 features 8 channels of analog signal conditioning (LNA+VCAT+PGA) and Digital Processing (ADC+Digital Demodulator) that brings a high level of system receive path integration and enables high-performance echo-location imaging for high-end SONAR systems. This reference design demonstrates this SONAR sub-system with a schematic modified from the AFE5809EVM. The test data included is taken by combining the full AFE5809EVM with the TSW1400EVM FPGA Capture Card and their respective Software GUIs in order simulate a complete receive chain solution capable of high-performance measurement. 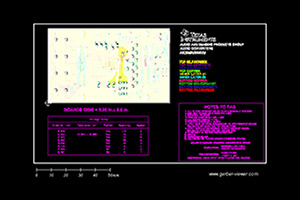 This design is tested and provides design reference materials including Schematics, and BOM.